Today’s blog post comes to you from the bottom of the garden. After hearing some interesting bird calls from over the wall, Tom took his long lens and I grabbed my binos, and we went on the hunt. 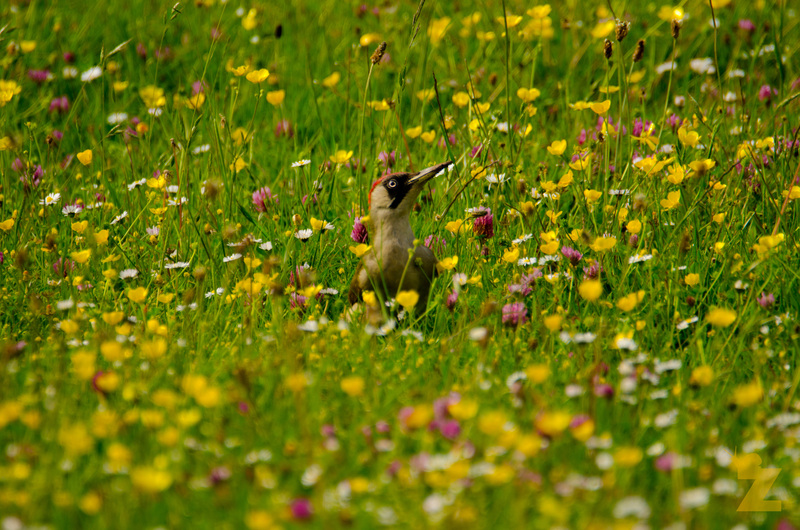 Sure enough, we pin-pointed the calls to this beautiful green woodpecker feeding on ants in amongst the flowers. Her red head kept bobbing up above the flora for a quick scope during feeding. Such a lovely sight! This was my first time observing a woodpecker of any species up close. The green woodpecker (Picus viridis) is part of the family, Picidae, which contains the woodpeckers and wrynecks. There are four subspecies, and they are found in most parts of Europe and in western Asia. Within the United Kingdom, green woodpeckers can be seen in England, Wales and Scotland, although they’re absent from the far north of the UK and Ireland. Interestingly, they are the largest of the three woodpeckers that breed in Britain. They spend most of their time feeding on the ground. And, just like our photogenic paddock inhabitant, use their strong beaks to dig into ant colonies and eat their fill. Whist ants form the bulk of their diet, they are known to eat other insects and small reptiles on occasion also. The European (also known as the Eurasian) green woodpecker (Picus viridis) derives its Latin name from the Greek word ‘pikos‘ meaning ‘woodpecker’, and ‘viridis‘ meaning ‘green’. But, by far, my favourite names for this bird are its folk names: Yaffle, laughing Betsey, yaffingale, yappingale, nickle, nicker pecker and Jack Eikle, just to name a few! As you might have noticed, ‘yaffling’, the name for the green woodpecker’s loud call inspired a few of these. There is a simple way to tell the difference between male and female green woodpeckers: Females have a black ‘moustache,’ as seen in all of our photos. Whereas in males, the black ‘moustache’ has a red centre, as seen in this illustration from the RSPB website below. Where Can I See a Green Woodpecker? Green woodpeckers need the combination of old deciduous trees for nesting, and plenty of ants nearby as a feeding ground. Such a combination is usually found in semi-open landscapes with small woodlands, hedges, scattered old trees, edges of forests and floodplain forests. Suitable habitats for foraging include grassland, heaths, plantations, orchards and lawns. Like other woodpeckers, they breed in holes they peck in dead wood. Listen out for their loud, laughing call; and look out for their undulating flight. Who knows this TV series? Did anyone get the reference? Do you know the green woodpecker by any other names? Great images! These are so hard to photograph as they are off at the first sign of anybody approaching. We have them in our local woods and sometimes I see them feeding on ants in the fields. It is such a beautiful bird. You’re right, Pete! We really did have to stay perfectly still. At the first sign of movement, she was off! Luckily for us, she uses the paddock at the bottom of the garden often. So, each day we heard her call, we would sneak down and hide behind the garden wall and attempt to get some shots :D. We took the photos in this blog post over several days. We’re glad you enjoyed them, too! You are welcome! A great achievement with excellent photos! Lovely photos, green woodpeckers are such beautiful birds, really interesting blog post to read. Have seen them every year in my garden since I’ve lived here. Love sitting in the kitchen with a coffee watching them strutting about the garden.